Editor's note: This story has been updated to include additional discussion about gifted and talented funding. Fort Bend ISD's Chief Financial Officer Steve Bassett started his career in the financial sector, working for powerhouse corporations like AT&T and PricewaterhouseCoopers. None of that work was as complex as learning Texas' school finance formula, he said. 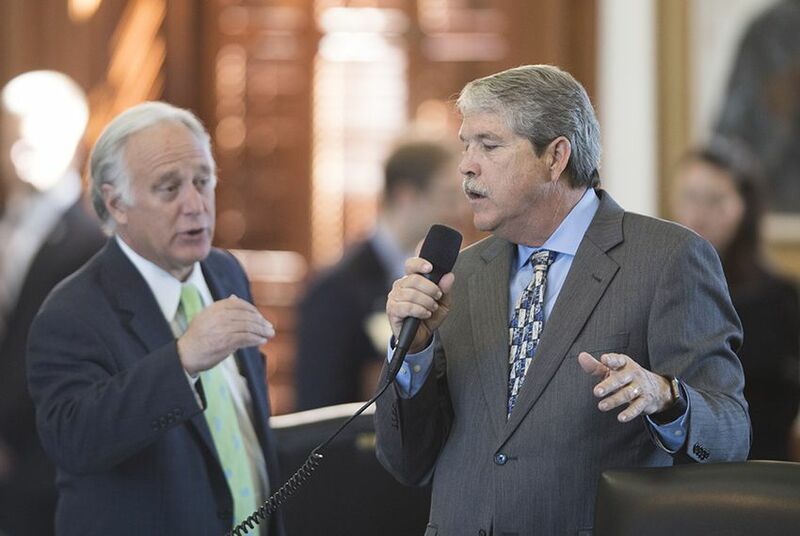 That's why he showed up at Tuesday's Senate Education Committee hearing to support chairman Larry Taylor's Senate Bill 2145, which would simplify the patchwork of formulas the state uses to fund public schools. The hearing on the senator's bill comes as both chambers are discussing how to fix a school finance system that has been the subject of various lawsuits, with educators arguing it does not give them the money they need to get students up to state academic standards. The House is discussing a bill Wednesday that would inject $1.6 billion into public schools. The current funding system includes some provisions based on costs from as many as three decades ago, which have not been updated since. Taylor's plan, developed by the Equity Center, an organization that represents school districts that collect less revenue from local property taxes, would strip these outdated provisions away. "The result is a school finance system defined in one chapter" that is easy to understand, Taylor said. The proposed formula would provide the same base per-student funding to every district, with additional money for students in four specific groups: English language learners, students with disabilities, economically disadvantaged students and students receiving training for technical jobs. That funding would then be multiplied by the local district's tax rate. Districts with higher property tax rates would get more money than those with lower property tax rates. This proposal would keep the state's Robin Hood system, which requires districts that collect more property tax revenue to subsidize those that collect less. It would also provide funding to help districts cover student transportation costs as needed. "It allows school districts to plan consistently from year to year," said Ray Freeman, executive director of the Equity Center. As written, Taylor's bill does not increase funding for school districts. It edits the state's formula, with the intention of distributing the money more equitably. According to the Legislative Budget Board's estimates, the bill would mean $11 million in additional administrative costs for the state over the next two years. Many showed up to testify in favor of the simplified formula. Others came to ask the bill's author for more language to protect certain student groups or districts. Some parents showed up Tuesday because they feared Taylor's bill would cut all funding for gifted and talented students. Taylor said his bill would not cut funding for gifted students; it simply changes how that money gets to school districts. Currently, state funding allocated to gifted students must go directly to services for those students. Taylor's bill would include the same amount of funding for gifted students without that requirement, leaving local school districts responsible for deciding how to use the money. Taylor said he would consider language to address parents' concerns in the bill. Several school finance reform advocates asked Taylor to ensure that the plan would help alleviate high local property taxes by getting the state to give more money to schools. Currently, local school districts pay just over half the total cost for public education, compared to about 45 percent in 2008. The state, which pays the difference, has been decreasing its share over time, instead relying on property tax revenue. Christy Rome, executive director of the Texas School Coalition, a group of mostly property-wealthy districts, said she worried the simplification of the formula would harm some districts in a diverse state. "We hope as this bill evolves and conversations continue that no district receives less funding than it has today," she said. The Senate Education Committee is considering extending a decade-old state aid program for small, vulnerable school districts that depend on it for vital operations. The program is set to expire in September. As lawmakers debate possible reforms to the school finance system this week, they might decide whether to continue offering extra money to districts like Texas City ISD, which last year was forced to annex a struggling district next to it.